In this study, three different catalysts were applied as catalysts for esterification of benzoic acid with ethanol, butanol and hexanol. These catalysts are ionic liquid, deep eutectic solvent, ion exchange resin. Amberlyst 15, ion exchange resin, was used as control catalyst to observe the catalytic activity of new generation solvent, deep eutectic solvent. Deep eutectic solvents show the similar properties with ionic liquids and have great attraction due to ease of preparation, low cost and environmentally friendly nature. They have many advantages such as reusability, stability, catalytically activity and removal of the reaction mixture. Deep eutectic solvents (DES) are composed hydrogen bond donor (HBD) and hydrogen bond acceptor (HBA). It has lower freezing point than that of individual constituents. In this study, p-toluene sulfonic acid (p-TSA) was used as HBD, benzyl tri-ethyl ammonium chloride (BTEAC) was used as HBA. DES formed by p-TSA and BTEAC was used as dual solvent-catalyst for esterification of benzoic acid with different alcohols. DES gave high catalytic activity among three different catalysts, 88.3, 87.8 and 67.5% conversion of benzoic acid for ethanol, butanol and hexanol, respectively. The effects of time, temperature, alcohol type and catalyst type were investigated in a batch reactor at specified conditions. It was found that DES provided the simple, efficient and environmentally friendly method for the synthesis of benzoic acid ester. 1. Othmer, K. Kirk-Othmer Encyclopedia of Chemical Technology, 4th ed. ; John Wiley & Sons: New York, NY, USA, 1994; p. 797. 2. G. Pipus, I. Plazl, T. Koloini, Chemical Engineering Journal, 2000, 76,239. 3. J. Lilja, D.Yu. Murzin, T. Salmi, J. Aumo, P. Mäki-Arvela, M. Sundell, Journal of Molecular Catalysis A: Chemical, 182–183, (2002), 555. 4. R. Rönnback, T. Salmi, A. Vuori, H. Haario, J. Lehtonen, A. Sundqvist, E. Tirronen, Chemical Engineering Science, 52, (1997), 3369. 5. Y. Liu, E. Lotero, J.G. Goodwin Jr., Journal of Molecular Catalysis A: Chemical, 245/1–2, (2006), 132. 6. A.D. Buluklu, E. Sert, S. Karakus, F.S. Atalay, International Journal of Chemical Kinetics, 46 (2014) 197. 7. S. R. Kirumakki, N. Nagaraju, K. V.R. Chary, Applied Catalysis A: General, 299, (2006), 185. 8. E.Sert, F.S.Atalay, Industrial & Chemistry Research, 51, (2012), 6666. 9. F. Rajabi, M.Abdollahi, R. Luque, Materials, 9, (2016), 557. 10. E. K. Gaifutdinova, V. V. Beresnev, Russian Journal of Applied Chemistry, 75/3, (2002), 4413. 11. Y.Q Cai, G.Q Yu, C. D. Liu, Y.Y Xu, Wei Wang, Chinese Chemical Letters 23, (2012), 1. 12. Q. Zhang, K. O. Vigier, S. Royer, F. Jerome, Chemical Society Reviewes, 41, (2012), 7108. 13. M. A. Kareem, F. S. Mjalli, M. A. Hashim, I. M. AlNashef, Journal of Chemical Engineering Data, 55, (2010), 4632. 14. V. De Santi, F. Cardellini, L. Brinchi, R. Germani, Tetrahedron Letters, 53, (2012) 5151. 15. M. B. Taysun, E. Sert, F. S. Atalay, Journal of Molecular Liquids, 223, (2016), 845. 17. 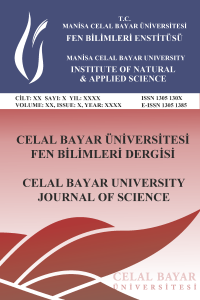 E. Sert, A. D.Buluklu, S. Karakuş, F.S.Atalay, Chemical Engineering & Processing, 73, (2013), 23. 18. N.C. Marziano, C. Tortato, L. Ronchin, C. Bianchi, Catalysis Letters, 64, (2000), 15. 19. S. L. Barbosa, M. Ottone, M. C. Santos, G. C. Junior, C. D. Lima, G. C. Glososki, N. P. Lopes, S. I. Klein, Catalysis Communications, 68, (2015), 97. 20. M. Wu, J. Guo, Ying Li, Yingjie Zhang, Ceramics International, 39, (2013), 9731.